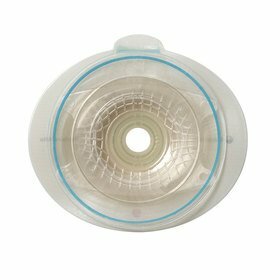 Coloplast Assura A/C Easiflex Two-piece Cut-to-fit Non-convex Standard Wear Skin Barrier with Flange 3/8″ to 3-1/2″ Stoma Opening, 3-1/2″ Flange, Round, Adhesive Coupling. These Adhesive Coupling (A/C) Cut-to-fit base plates together with pouch feature a flexible, adhesive two-piece coupling system that conforms to the body. The base plate adheres to the skin, the pouch adheres to the base plate with no rigid coupling to snap together. These have a special security channel for added protection against leakage and include an integrated charcoal filter in every pouch.